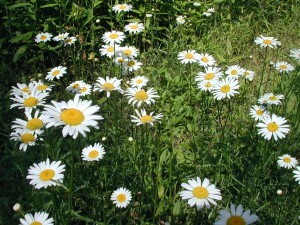 Summertime flowers generally won’t be found in the forests. They just don’t get enough sunlight among the trees. 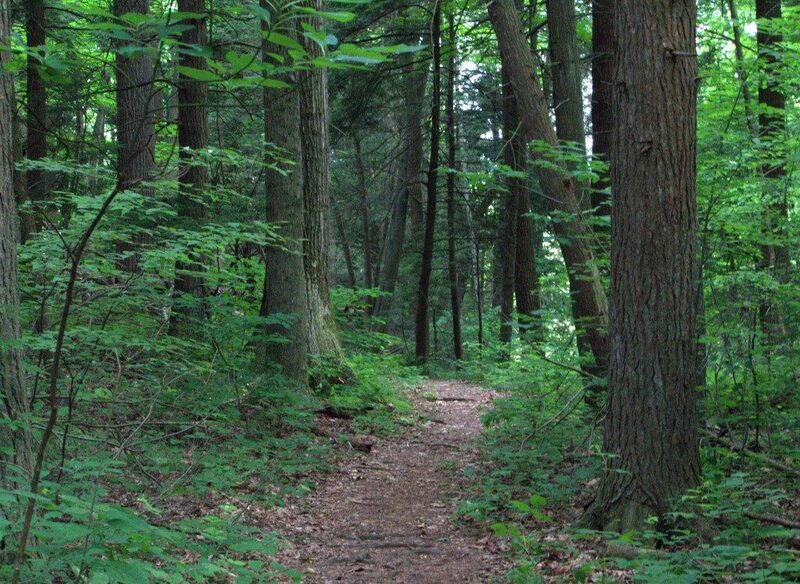 It was a cloudy day when I took a walk at one of my favorite haunts and it seemed pretty dark on the parts of the trail that meandered through the forest. Cooler, but dark. Surprisingly dark when looking through the camera lens! It’s technically the third week of Summer now and the heat and humidity will have you feeling every sticky note of it. 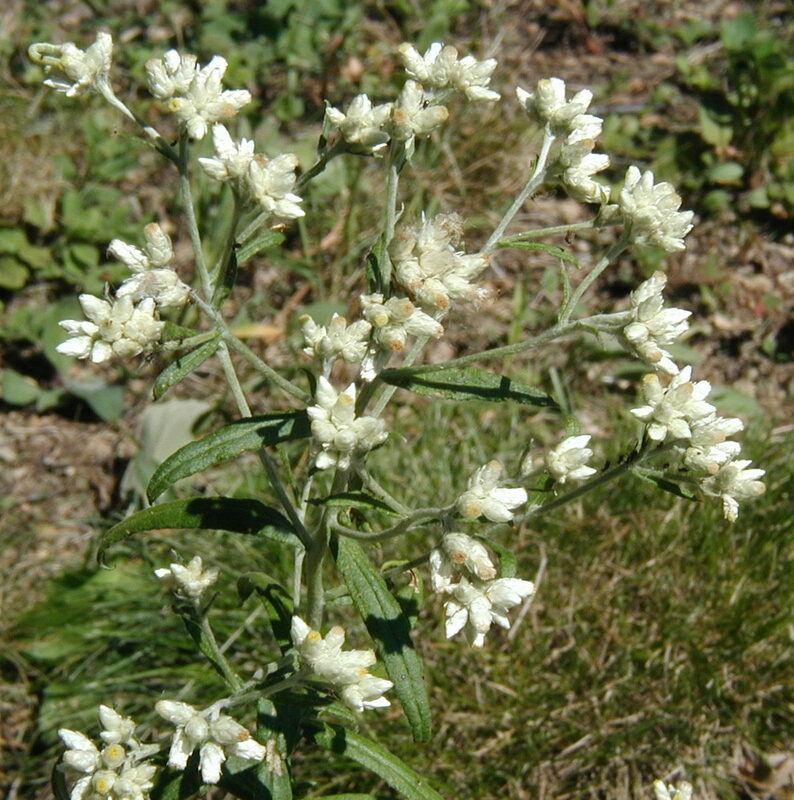 I did find one new plant flowering in several places at Little Buffalo State Park along the Mill Race Trail and around the Day Use Area. 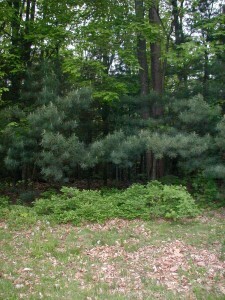 It was a tall plant reaching over 6 feet in a couple of spots. 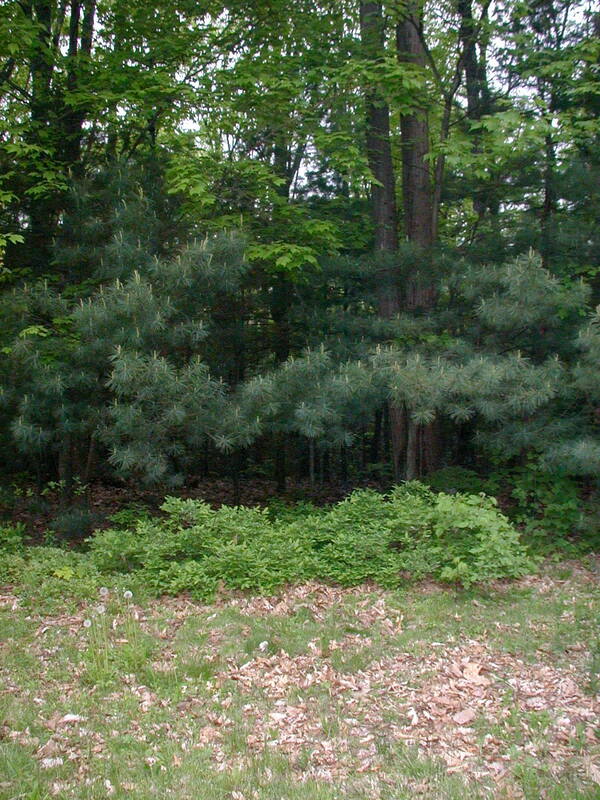 Places where it was seen flowering profusely were areas receiving lots of light from above, not among the trees in the forest. If the canopy was thick, there were no flowers that I could see. 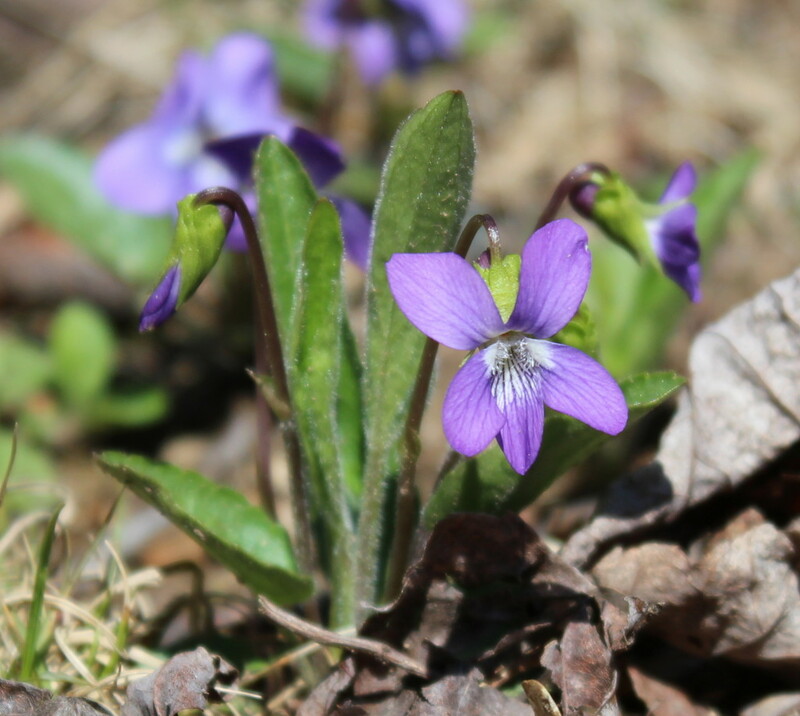 Northern downy violets and common blue violets were very pretty for the last month. 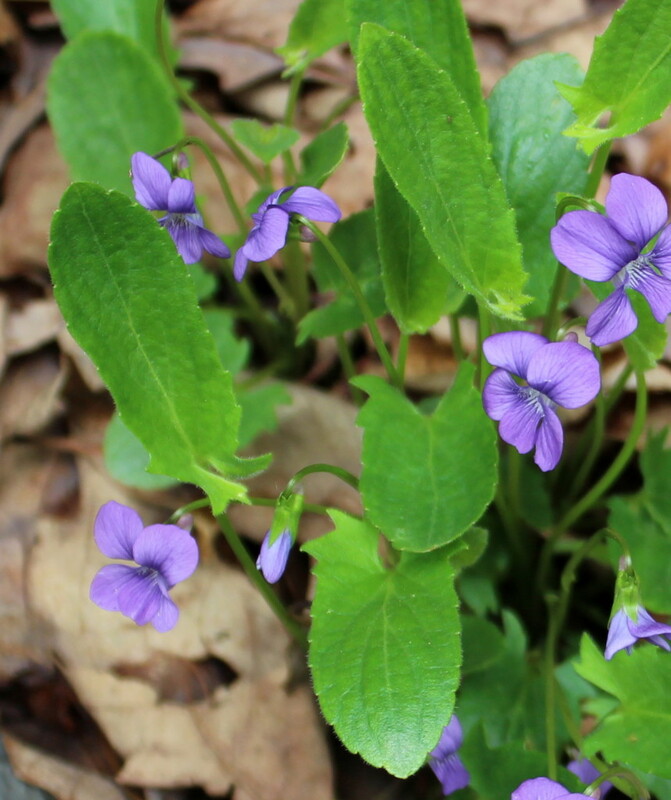 At our location in south-central Pennsylvania the common violet comes into full bloom about a week after the northern violets are peaking in their abundance. Downy northern violet starts blooming here during the last week of April. As a community they bloom for at least a couple of weeks with new flowers springing up in between the long scalloped leaves of any given plant. Violet plants that receive only morning sun started blooming later than those in the open yard, so our entire blooming season for these pretty purple violets lasts about a month. Downy leaves of the downy northern violet. Common blue violet in the lawn. 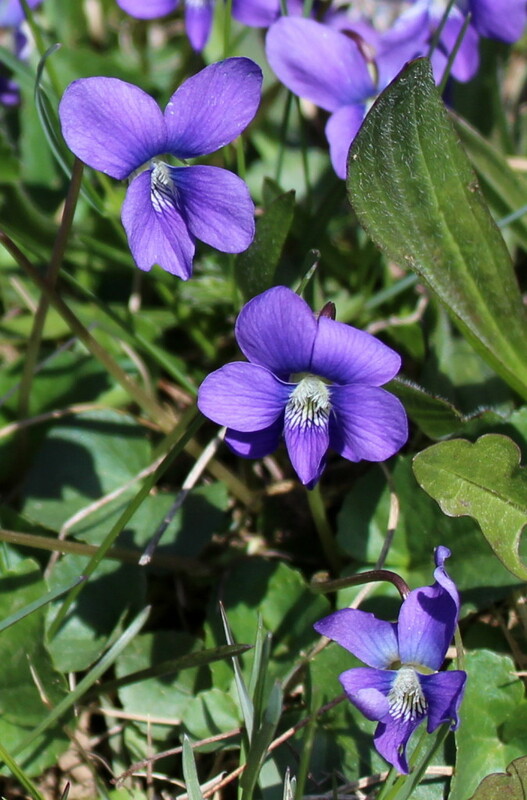 The easiest way to tell the difference between downy northern violet and the common blue violet is to look at their leaves. The downy northern has elongated leaves with scalloped edges and spurs on each side at the base of each leaf. 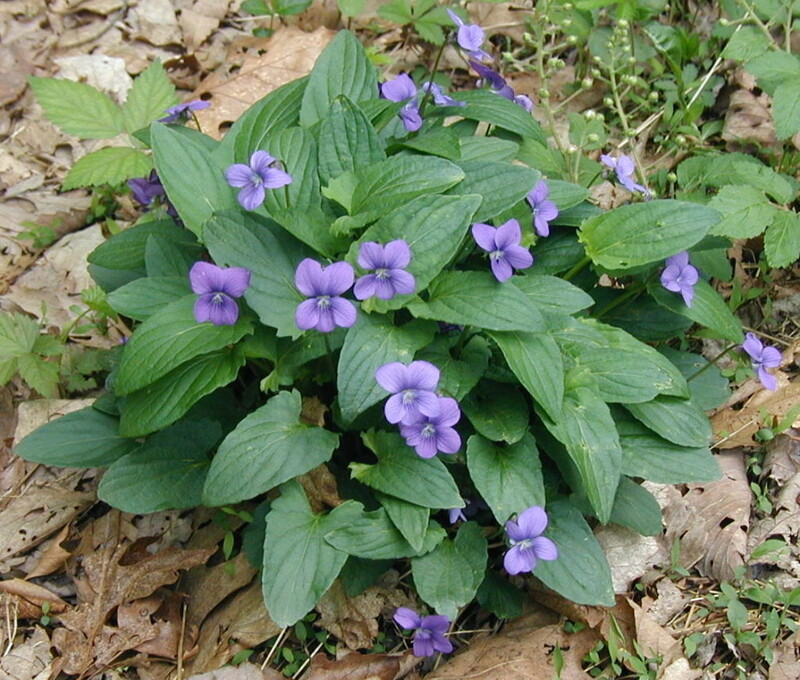 The first leaves of the season are shorter and somewhat rounded and they may be confused with the common blue violet leaves which are heart-shaped leaves with scalloped edges. Elongated downy northern violet leaves. Common blue violet with heart-shaped leaves. 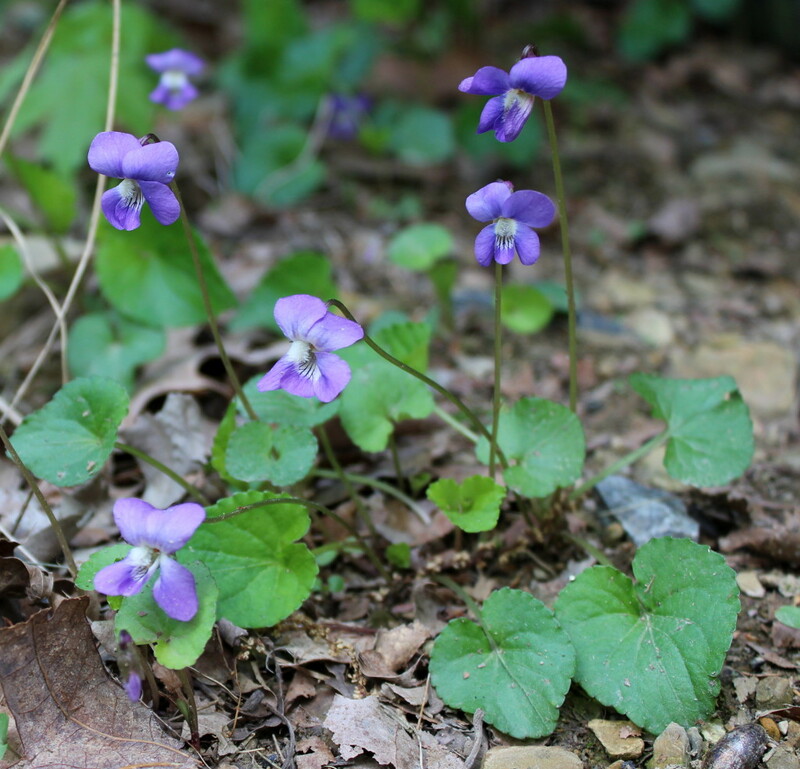 We appeared to have lost the only two examples of arrow-leaved violets this winter. 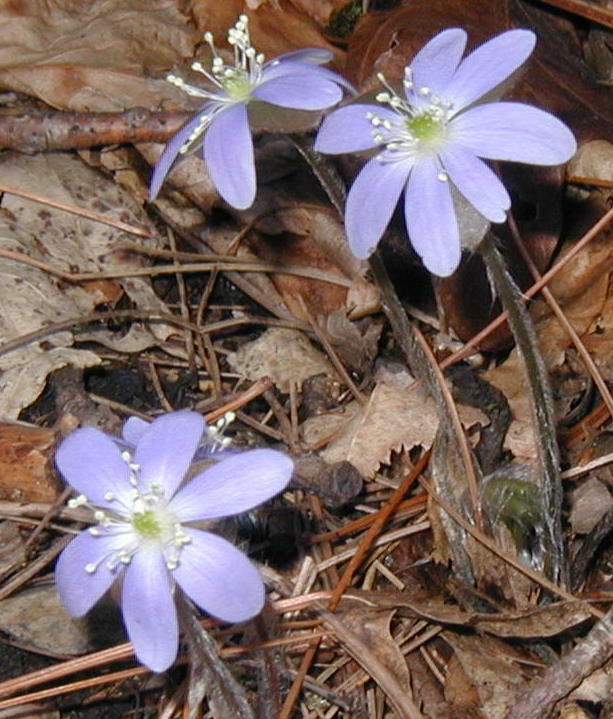 These plants were different than the much more plentiful common blue and downy northern violets. The leaves were large and the whole plant noticeable from a distance merely due to its size, as compared to the diminutive downy northern violets. The blooms weren’t much different as I remember, but the leaves were more wedge-shaped than the upright and narrow leaves of the downy northern violet. We decided to hold off on making violet jelly this year. We still have one jar and plenty of other jellies in the pantry, so as Momma would say, “Waste not, want not!” We’ll save the sugar for making blackberry jelly or maybe elderberry jelly in 2 or 3 months. This rainy year produced some spectacular flower displays. 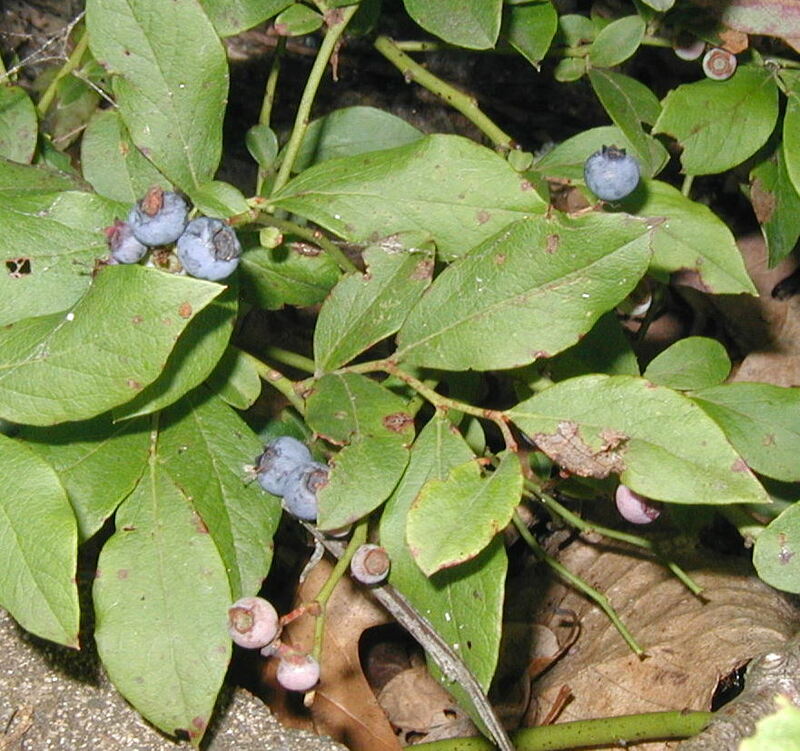 One that we see in the forest is called Deerberry, Vaccinium stamineum. It’s a member of the Heath Family, Ericaceae, as are the blueberries and huckleberries, and it’s also native to the eastern United States. 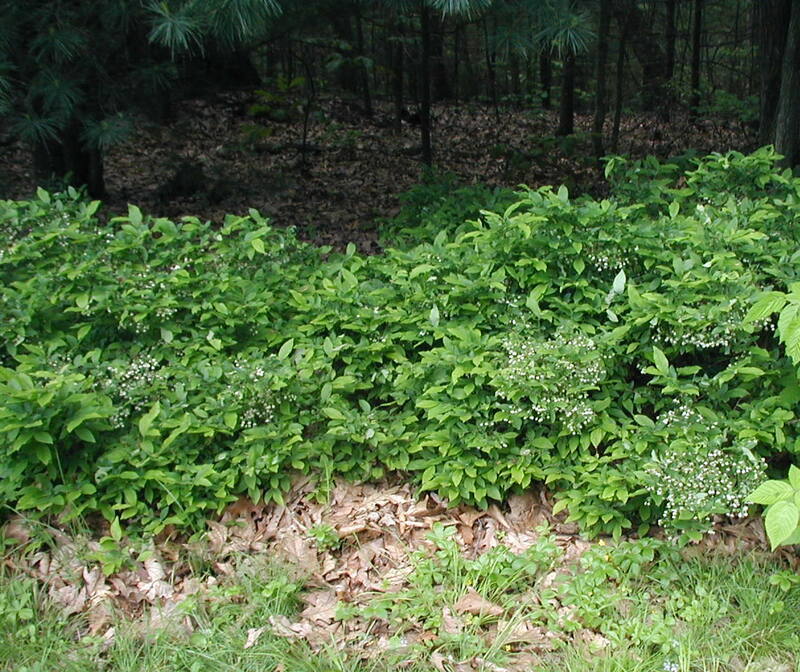 Small deerberry shrubs at the edge of the woods are 2-3 feet tall. Photo taken 13 May 2011. The foliage looks a lot like that of the lowbush blueberry, but the flowers are distinct. 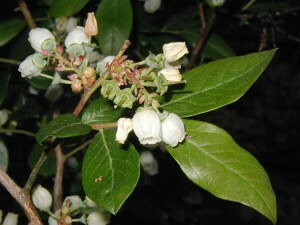 Each bell-shaped flower is white to pinkish-white with many stamens that protrude beyond the edge of the short bell. 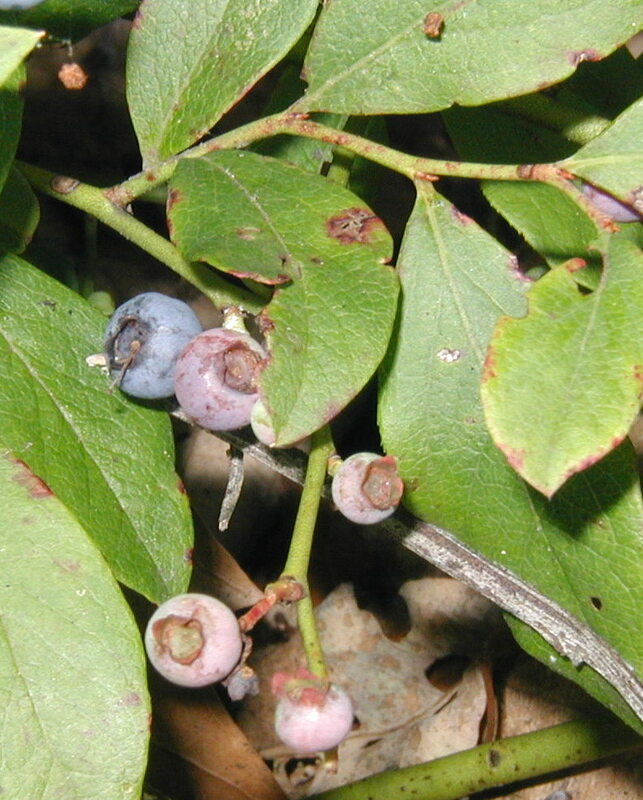 The five lobes at the edge of the bell do not flare outward as the blossoms of the blueberries do. 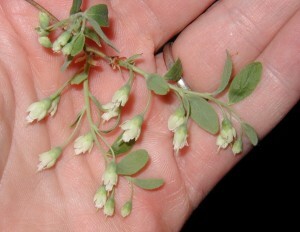 The flowers are arranged in loose clusters where each blossom dangles just below a small leaf on the main stem. 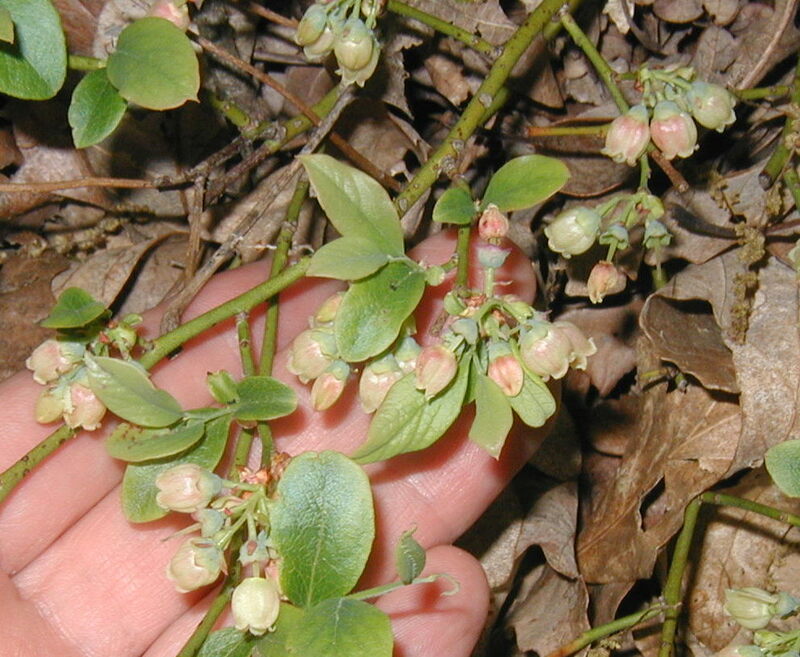 This ‘leafy-bracted raceme’ is a character worth noting to identify deerberry. 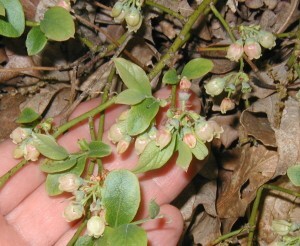 Three leafy bracted racemes are present in this closeup of deerberry flowers with their long stamens. Photo taken 13 May 2011. 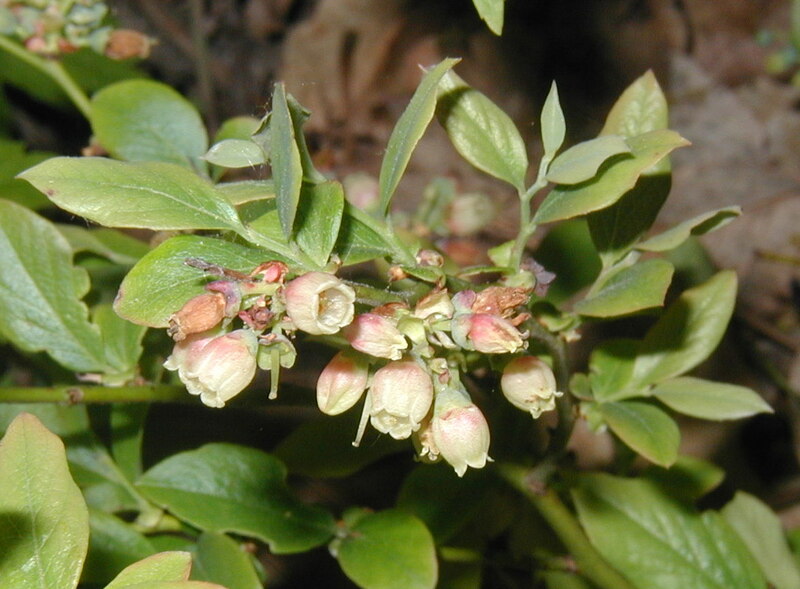 By holding up a branch of the deerberry, you can see how the flowers dangle below their stem. Photo taken 13 May 2011. Mass blooming of deerberry. 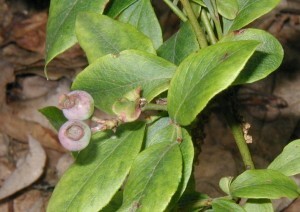 Note how the flowers are tucked behind the new growth of light green leaves. Photo taken on 23 May 2011. 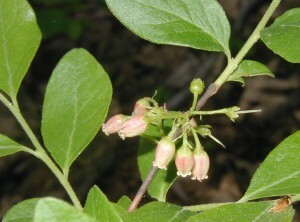 Deerberry blooming at the edge of the woods on 23 May 2011. The Ox-eye Daisy is very common along roadsides, in fields and waste places in the United States and Canada. 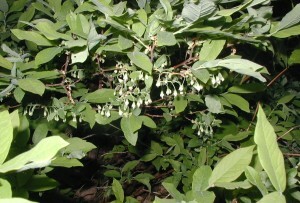 Maybe it’s so common because it is an introduced or alien plant that isn’t native to this part of the world. The white petals and yellow “eye” are really the ray and disc flowers of this perennial, composite flower, Leucanthemum vulgare. 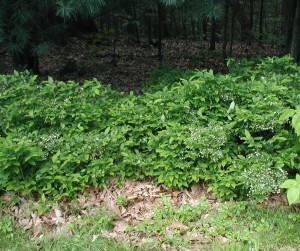 Large groupings of this old time perennial are often seen along the highways. Photo taken 10 June 2010. Ready for cut flowers in a vase. Leaves are sparse and very narrow with widely separated pointed teeth. 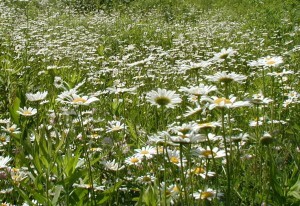 Like many of the composites this wild daisy can be mowed over and it will regenerate another set of flowers. 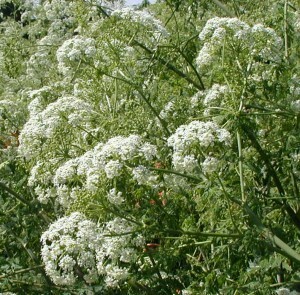 From the end of May and for nearly the whole month of June we kept seeing this tall flowering weed everywhere. 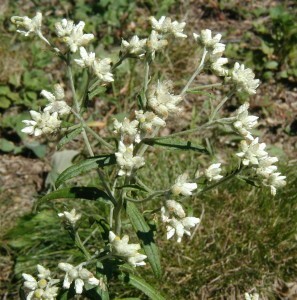 It pops up in fence rows, empty fields, along the highway, near the river and in waste areas. 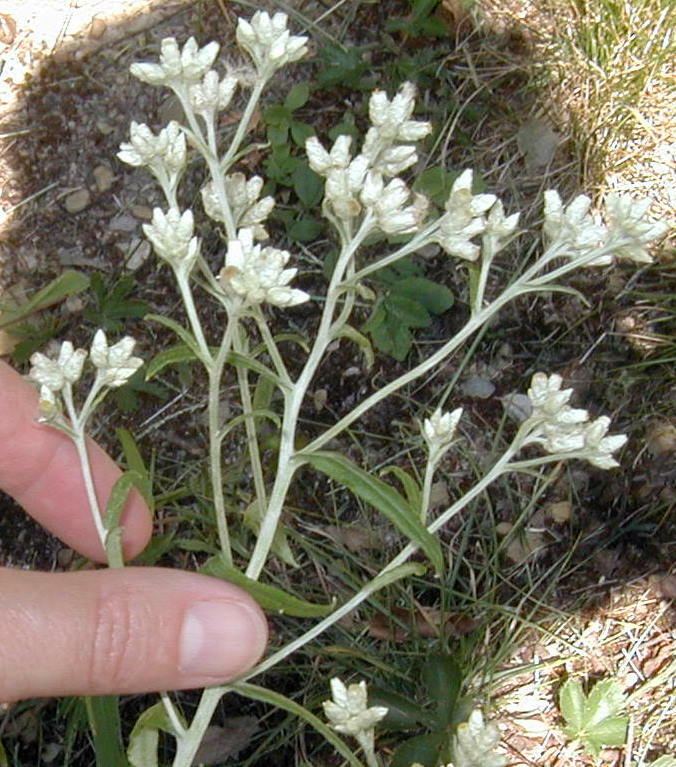 It’s a tall plant that reaches 4-8 feet tall, with a few individuals getting up to 12 feet tall. This weedy alien plant blooms for a few weeks with very small white flowers in rounded clusters or umbels. I have to admit the whole plant had this wierd smell. It was a funky smell that might be described as acrid or dank, kind of like wet dirty socks. A week later I stopped at a parking lot to get some pictures of the weed. 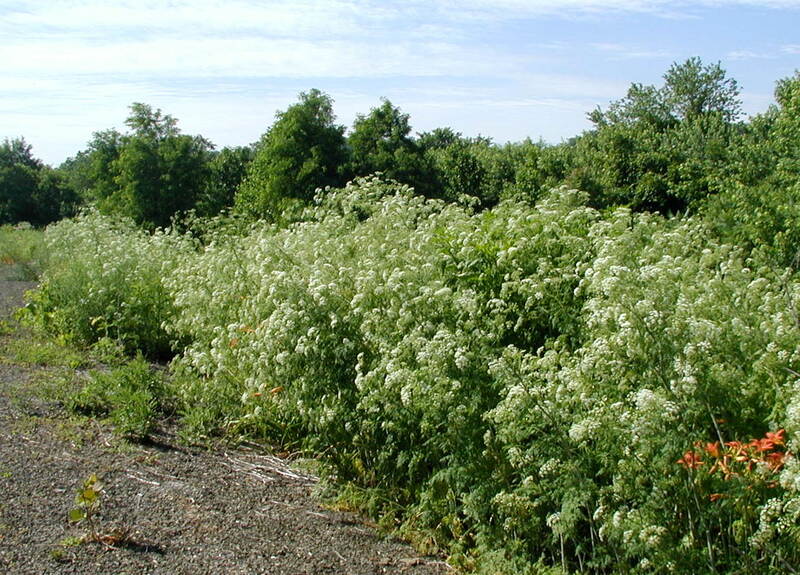 Where the edge of an empty field met the gravel of the parking lot, the Poison Hemlock grew prolifically there. The smell was undeniable. Poison hemlock growing in an open area at the edge of a parking lot. Phew! No wonder flies pollinate this stinky stuff! 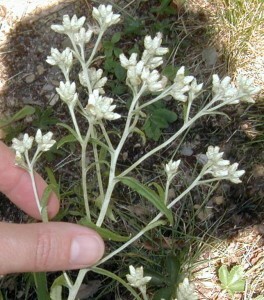 Many small white flowers, less than a quarter-inch across, held in umbels. 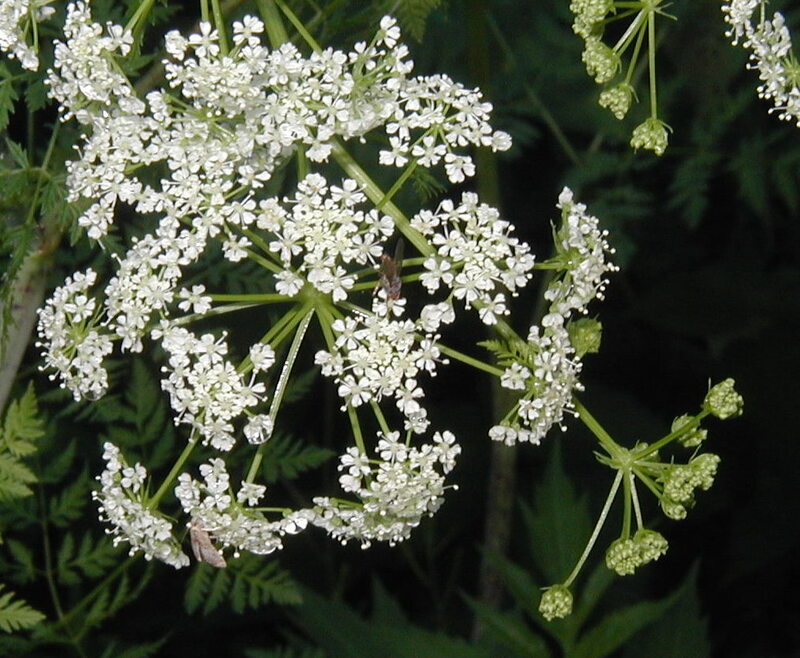 Several umbels are already setting seed while other umbels are blooming. 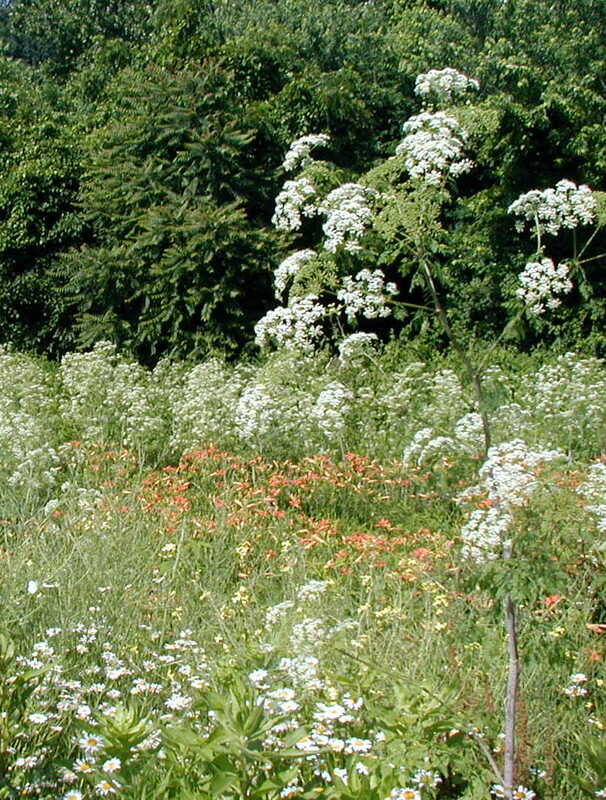 The rounded umbels of poison hemlock make it easy to spot along fence rows. In the photo above the foreground flowers are oxeye daisies and the white flowers in the background are poison hemlock. 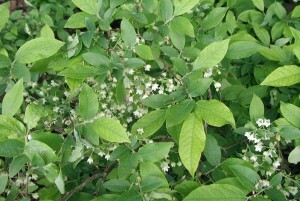 The smell alone should alert anyone that this plant shouldn’t be ingested, but every year several people try it anyway. Why anyone would think a white and purple blotched “carrot” is an edible one is the mystery. We all know their tap roots are orange! 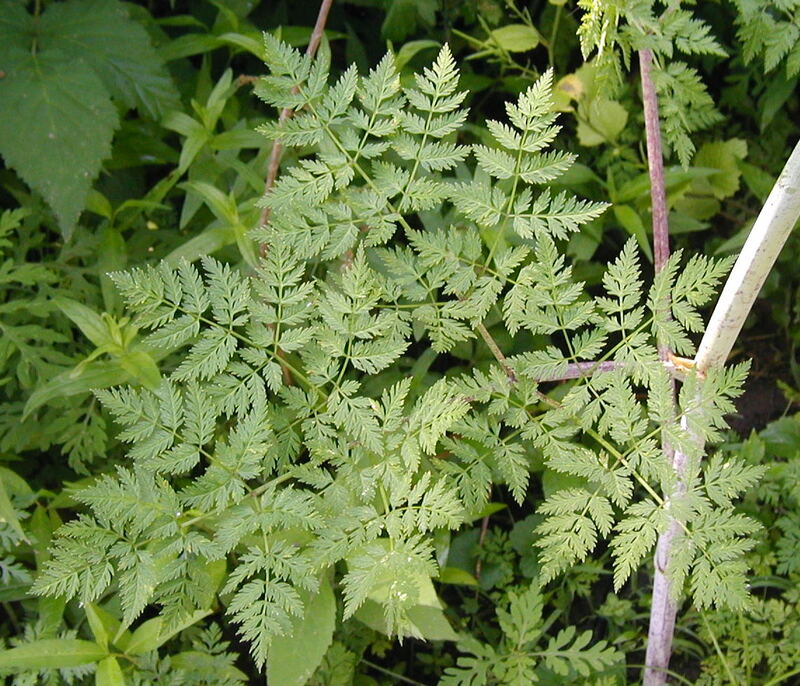 Cohorts of poison hemlock at the parking lot were sumac, daylilies, oxeye daisy, purple loosestrife, nightshade, blackberries, common mullein and crown-vetch. The large compound or divided leaves appear rather lacy or fern-like and they clasp the main stem, sheathing it. Purple blotches or spots are highly visible on the substantial stems, especially at the base. 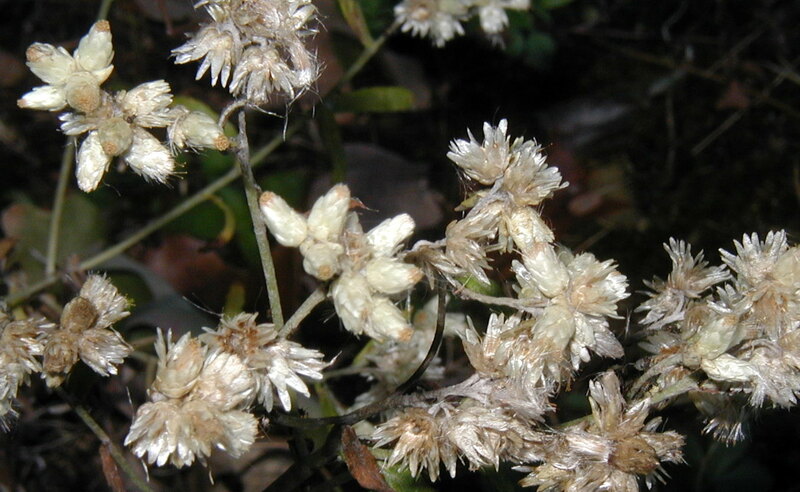 This plant may look sort of like wild carrot, but the tap root is white with purple spots and streaks, not orange. Do not attempt to eat any Parsley Family members without assured identification. Death may result! 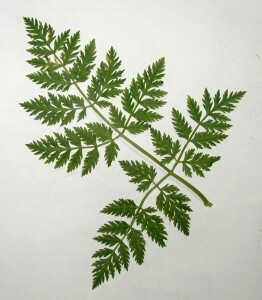 A single compound leaf of poison hemlock. Note the purple stem coloration. 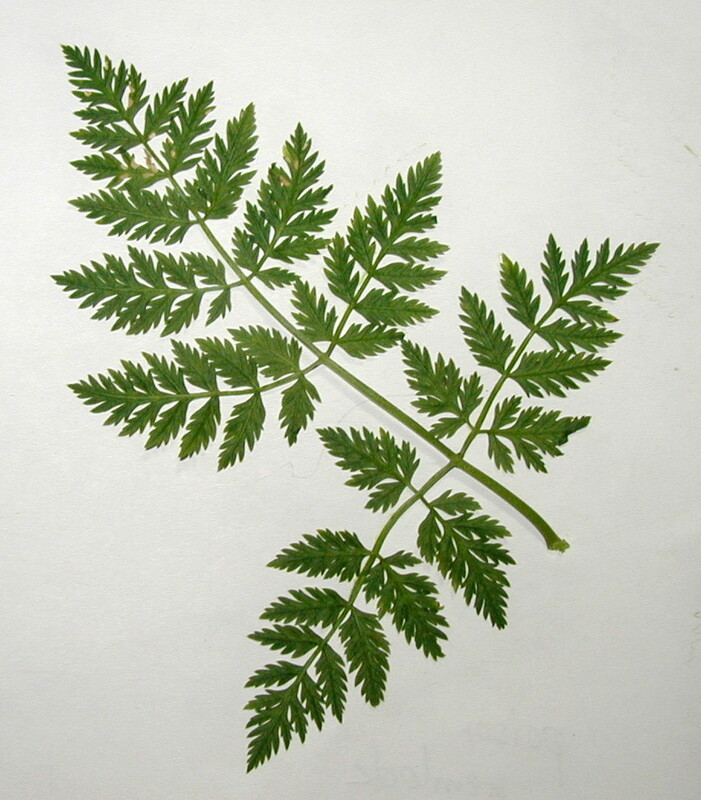 A single leaflet, one of three, of poison hemlock. 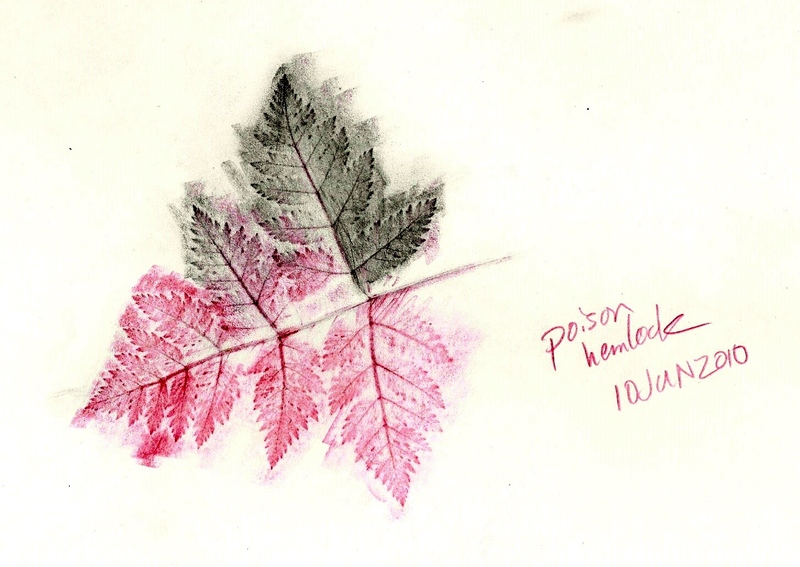 Pencil rubbing of partial leaflet of Poison Hemlock. Close-up view of poison hemlock flowers held in umbels. 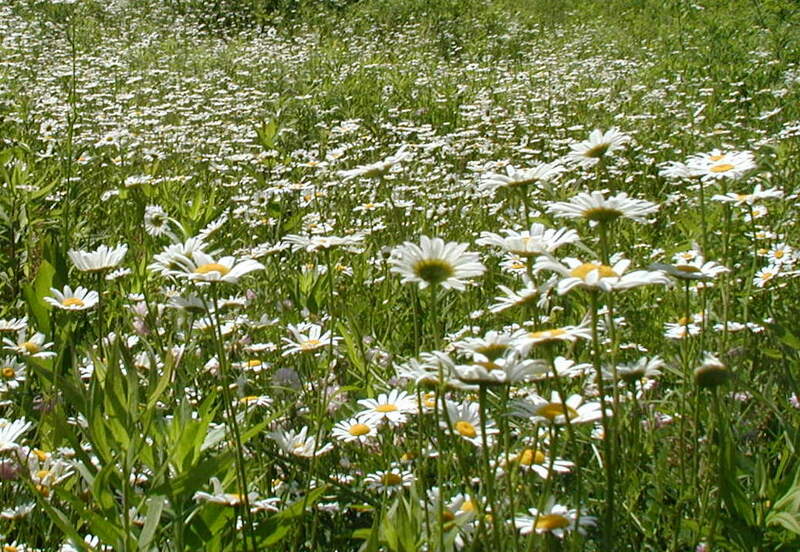 Photos taken 10 June 2010. 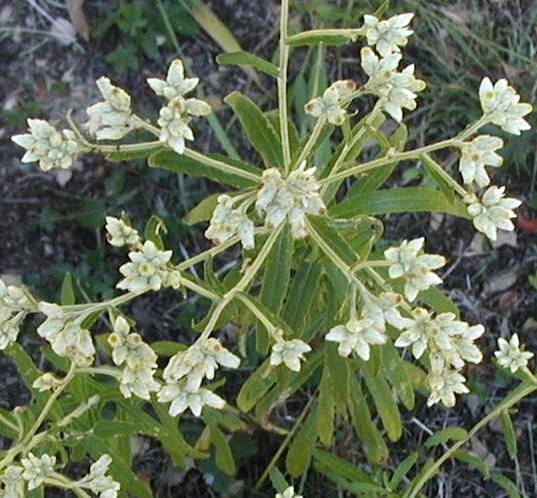 The small bracts underneath the umbels are entire. 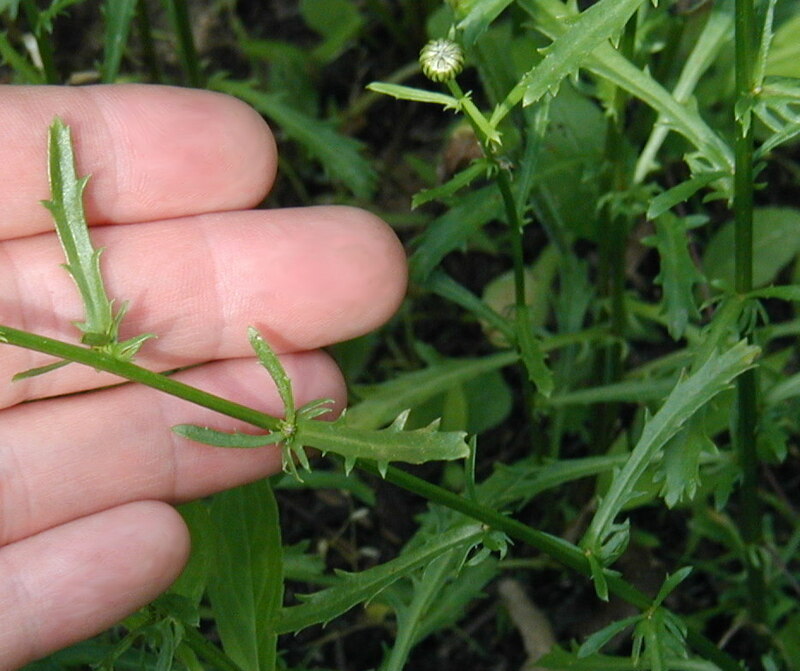 Another member of the Parsley Family, Wild Carrot or Queen Anne’s Lace, Daucus carota, has divided bracts that are deeply and narrowly lobed. If you remember your history lessons, poison hemlock was used to kill the famous philosopher Socrates back in ancient Athens. A very small amount ingested can cause death. 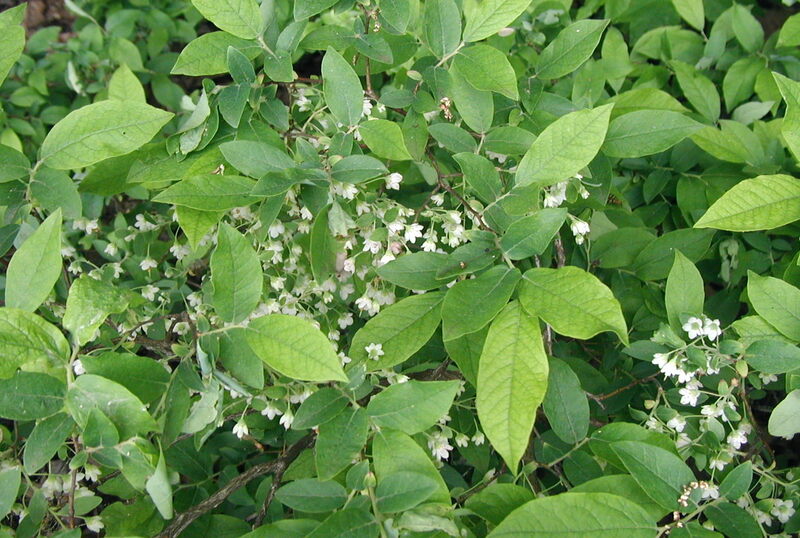 Take caution and realize that the juice from the plant can cause dermatitis. I didn’t suffer any rash or itching after I handled it, but some people might be sensitive to it. Do not handle if at all possible. 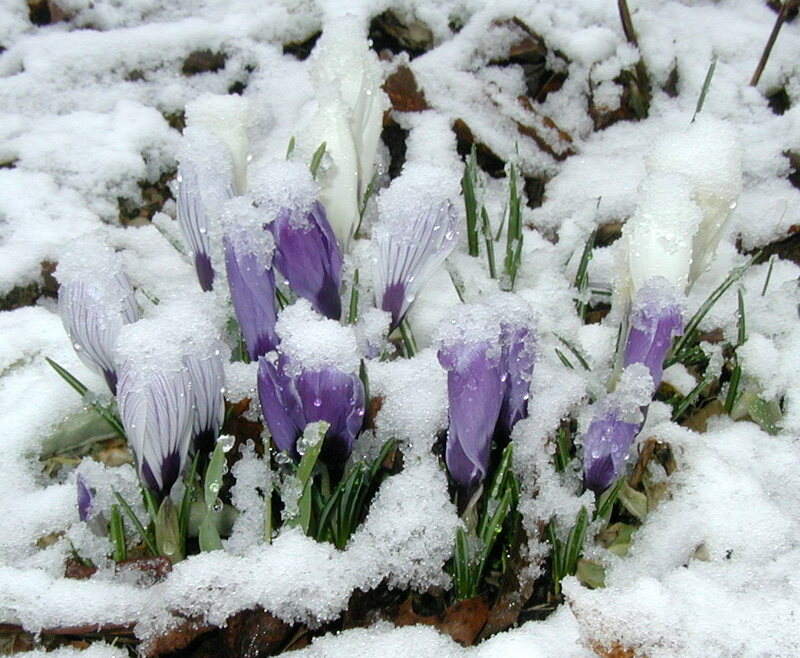 If pulled up, use gloves and do not put in compost heap or the seeds may come back to haunt you. Dispose in plastic bag in the garbage.